The market is wrecking higher education. Universities are competing for numbers but not for quality while vulnerable universities are being set up to “fail”. Staff are facing pay cuts, job losses and increased precarity. Students are facing financial insecurity, competing work/study demands and uncertain futures. We’re not having it. Thousands of university staff went on strike to defend their pensions and totally discredited the employers’ arguments that the scheme was unsustainable. Staff and students have mobilised together to campaign against the dodgy landlords, outsourcing, zero hours contracts and redundancies that characterise higher education today. 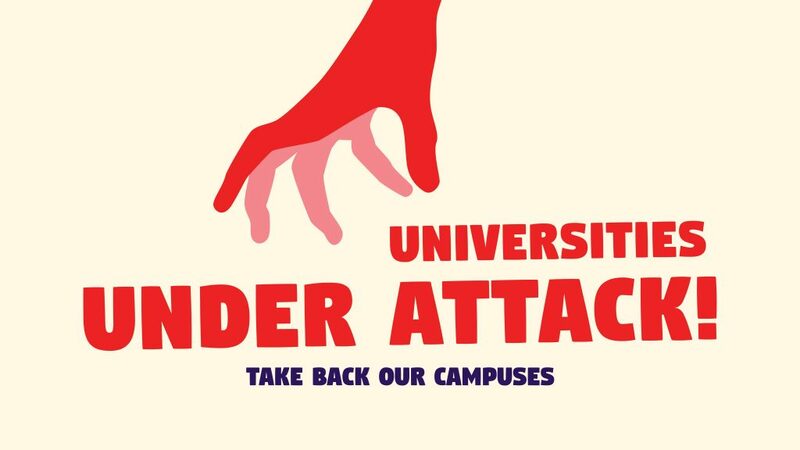 As UCU members ballot over action for fair pay to fight casualisation, workload and the gender pay-gap, we want to bring together as many people as possible to discuss how we can organise and begin to push back this huge assault on our education.